The United States is under attack and we can expect such to remain the situation for the foreseeable future. That's my summation of Director National Intelligence (DNI), Daniel R. Coats' presentation, "Worldwide Threat Assessment of the US Intelligence Community," on May 11, 2017 to the Senate Select Committee on Intelligence (SSCI). Coats walked the SSCI through the various avenues by which the security of the United States was being placed in jeopardy: Cyber Threat, Emerging and Disruptive Technologies, Terrorism, Weapons of Mass Destruction and Proliferation, Space and Counterspace, Counterintelligence, Transnational Organized Crime, Economics and Natural Resources, and Human Security (SSCI - DNI Coats video). Let's look at a few of these - Cyber, Technologies, Space and Counterintelligence. It should come as no surprise that Russia, China, North Korea and Iran lead the list of nation state actors who are actively targeting the United States. The takeaway for each of us is that this targeting is not limited to governmental entities - though there is no shortage of examples of successful compromise of government programs and systems. Of particular note is the highlighting of the nation states interest in attacking corporate America. While we normally attribute nation state activity to that involving national security (defense and infrastructure) efforts to influence decision making and sowing distrust are identified as areas where success has been achieved. Additionally, companies must remain vigilant to the targeting for theft of their data, be it cutting edge research or personal identifying information. They must also be alert to the tactic of data destruction vice theft, as was the case with Iran when they targeted Las Vegas Sands Corp in 2014. Not surprising, Coats also called out the omnipresent and ever growing threat posed by the compromise of the "internet of things" (IoT). He also noted how the medical sector was firmly in the targeting sights of the cyber criminals with an influx of ransomware attacks having occurred throughout 2016. Coats' shout-out to the advancement of artificial intelligence (AI) capabilities is worthy of approbation. 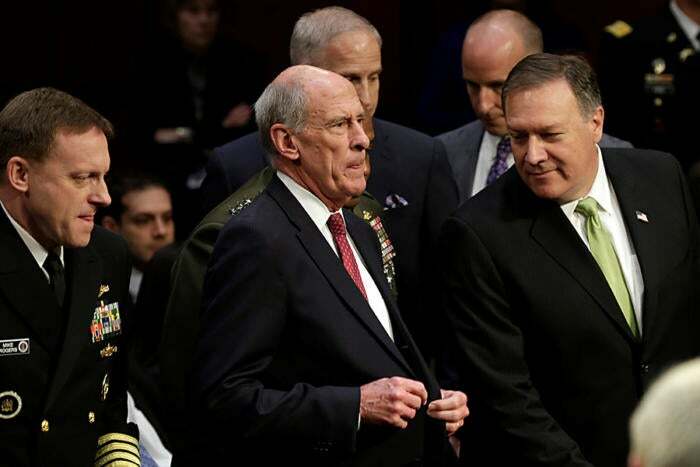 "The implications of our adversaries' abilities to use AI are potentially profound and broad," said Coats in his testimony. Furthermore, these advances will continue to make the "attribution" question a difficult one to answer when analyzing cyber attacks. Also of interest was the inclusion of "Space Warfare" as a highlighted topic to the SSCI with both Russia and China investing in the necessary means to "offset any US military advantage." The implication for private industry? Those dual-purpose satellites upon which we rely (GPS, communications, imagery) are on the target list of these adversaries. Perhaps the most important segment of the briefing was that which focused on foreign intelligence threat. Coats' description, "The United States will face a complex global foreign intelligence threat environment in 2017" is not hyperbole. One has come to expect, China, Russia, and Iran to be active. Coats' call out of nation states located in other areas of the world (South Asia, Near East, East Asia and Latin America) is chilling. Here is what Coats said is what can be expected to be on the target list of these nation states. "The targeting of national security information and proprietary information from US companies and research institutions involved with defense, energy, finance, dual-use technology, and other areas will remain a persistent threat to US interests." The insider threat posed by trusted insiders, "will remain a significant threat in 2017 and beyond." While we may all collectively hope the DNI has overstated the threat, the reality is this unclassified briefing, while alarming in its own right, is no doubt the tip of the iceberg and the SSCI's classified briefing will provide additional illumination to the SSCI. What is certain is that there is no doubt that the US public and private sectors are under attack and have their work cut out for themselves.